Choosing kitchen cabinet colors can be difficult, especially with all the choices out there these days. Whether you go with a paint finish or a natural wood look is all in what is right for your home. But I can help you narrow down which colors are more popular right now. Keep in mind that no matter what color or species you choose, it may be out of style in a couple of years as the trend changes. This is why, above everything else, it’s important to choose something YOU are happy with! After all, you are the one that has to walk into your kitchen everyday and feel good about it! So I’d put style concerns on the back burner. When it comes to wood finishes on kitchen cabinets – cherry, maple and oaks are still quite popular. It just depends on what market and what part of the country you’re in. Consider your home’s unique location and what is being purchased in your area. Also consider the price point your home is at. You can easily spend more money on a remodel than you actually should. You can also spend too little, as well. If your house is in an expensive neighborhood and you are looking to sell one day, then don’t cheap out with your cabinet selection. The buyers will notice and it may be a road block to selling your home, even with the changing cabinet styles. Quality cabinets, are timeless in this regard. As for wood finishes in the high-end markets, the trend is going more towards the exotic species and unique grain woods. If you aren’t sure what a unique grain wood is, think knotty chestnut, quarter-sawn oaks, hickory and hemlock. Basically anything other than the predictable small grain woods. People are looking for more character and choosing natural finishes with these woods. These woods often become the focal point of a kitchen so it is important to consider this when pairing it with your granite. If you choose your granite because it stands out, you might want to look to a less noticeable wood grain or a painted finish cabinet instead. When it comes to painted cabinets, people seem to be shying away from white. Instead creams and soft yellows are gaining in popularity. So are earthy greens, deep blues, blacks, grays and reds. And the heavily distressed look seems to be going out of style. Instead, look for light glazes and solid colors. 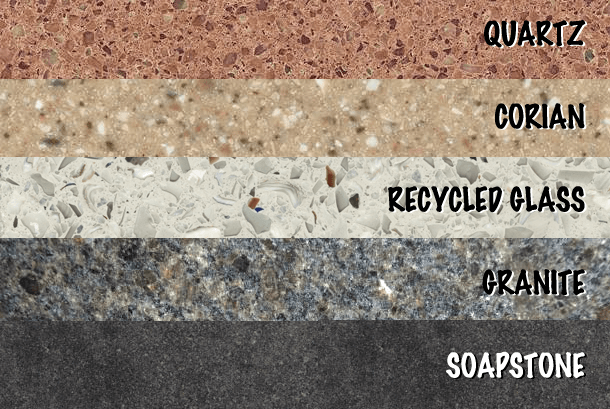 What color you choose should be based on your granite and what goes with your own personal style. Neutral is always a good choice if you are selling your kitchen, since the cabinets are permanent fixtures. But only choose neutral colors if you aren’t planning on staying in the house and if that is what you like. It won’t do you any good to choose a nice neutral if you really wanted a beautiful deep blue! Also, you don’t have to choose just one color or finish. You can choose a different color for your upper cabinet’s than your lower ones. If you have an island, those cabinets can be different compared to the rest as well. And the style of the cabinet can be different too, as you move from the uppers to the lower cabinets. I’ve also seen a trend to make a specific area stand out more than others. I was in one kitchen last week that the designer had created an armoire furniture-effect around the refrigerator. The cabinets there were much more ornamental than the rest of the kitchen. It looked great and it just goes to show that you can be creative when making these decisions! Choosing kitchen cabinet colors can become really overwhelming, but it doesn’t have to be. If you aren’t sure what colors would look good in your home, consider talking to a designer, home stager or even a realtor. Combine that with a little research and you can find the perfect kitchen cabinet colors for you!